Manny Pacquiao (black trunks) and Adrien Broner (purple/gold trunks) box during a WBA welterweight world title boxing match at MGM Grand Garden Arena in Las Vegas, U.S.
WBA welterweight champion Manny Pacquiao showed flashes of his past brilliance as he delivered a dominant performance to earn a unanimous decision victory over Adrien Broner in Las Vegas on Saturday. The 40-year-old Filipino multiple world champion was quicker and more accurate as he controlled each round and cruised to the triumph to take his career record to 61-7-2. 29-year-old American Broner fought gamely and stayed upright despite being hit with several heavy combinations but was ultimately outclassed. Retired great Floyd Mayweather attended the fight, fuelling speculation of a rematch against Pacquiao, who the undefeated American beat in 2015. Two judges scored the bout 116-112 in favour of Pacquiao, while the third had the Filipino Senator a 117-111 winner. About the only person in attendance who disagreed with the outcome was Broner (33-4-1), who protested the result emphatically in his post fight interview. It was difficult to take Broner’s claims seriously on a night when he was relegated to the role of defensive fighter. Pacquiao appeared the younger and more spry of the two as he attacked his opponent’s midsection and ultimately landed 47 body shots to Broner’s three. Pacquiao nearly knocked his opponent down again in the ninth when he delivered a clean left hook to Broner’s chin that knocked him back. “I wanted to push more but my trainer said ‘do not be careless, wait for him and you counter’,” Pacquiao said. 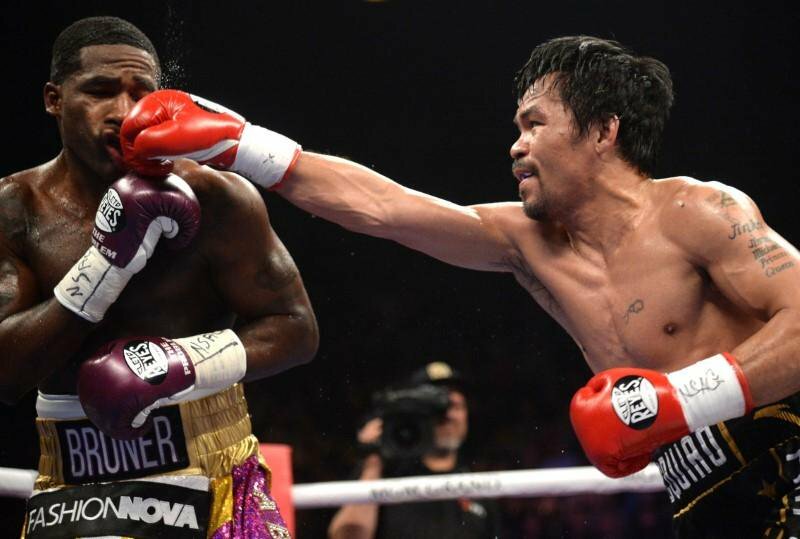 The final few rounds were anticlimactic as Broner played it safe and Pacquiao stayed in control. At the final bell, Pacquiao dropped to his knees in his corner for a moment of contemplation. Pacquiao is enjoying a career turnaround after uninspiring efforts that left many believing his career was nearing an end. Mayweather, whose last outing was a farce of an exhibition bout against a Japanese kickboxer, refused the entreaties of a ringside TV reporter to indicate whether he would be willing to fight Pacquiao again. The Filipino was less reticent. “Tell him to come back to the ring and then we will fight,” Pacquiao said.